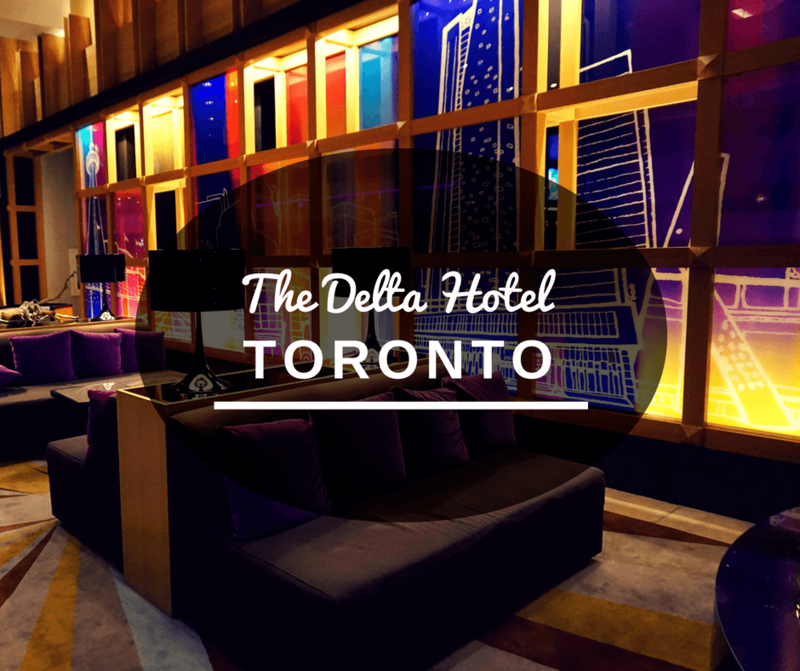 If you’re wondering where to stay in Toronto, Canada, then we recommend the Delta Toronto. It has everything you need to make your stay in “The 6ix” unforgettable. Sure, there are plenty of places to stay in Toronto, but this stylish Marriott property is the one we’d recommend hands down. From the staff to the decor, the amenities to the location, this hotel was exactly what we needed for our extended weekend trip. When we went to check in, we were greeted with big smiles. The check in process went quickly and smoothly, which was perfect because we wanted to take a look around the large lobby. It has such a modern, fun, and vibrant vibe! Whenever we walked through it, there were always people hanging out and making good use of the hotel’s comfy and colorful couches. We absolutely loved our room! We had a large king sized bed with some of the softest pillows we’ve ever slept on. There was also a desk, large closet (with a robe! ), television, mini refrigerator, coffee maker, and outlets everywhere which were perfect for charging all of our devices. We also had a stunning bathroom with breathtaking views (floor to ceiling windows will do that to you). It’s been awhile since we stayed anywhere with a bathtub, so that was very much appreciated, as well as the sleek and modern shower and sink area. Their signature restaurant, SOCO Kitchen + Bar, offers breakfast, lunch, and dinner. We stopped in a few times and were delighted each time with a variety of options (and the always friendly service). The breakfast buffet was impressive and you could also have omelettes made to order or order from their breakfast menu. When we stopped in for lunch we had a pizza that was a bit larger than we expected (always a good surprise) and had some wine. The restaurant also has a small bar area which we visited the first night of our stay for some late night french fries. It’s also just a fun place to hang out and watch some sports. The Delta Toronto also has a whiskey bar with one of the widest ranges of Canadian whiskies in Toronto. Char No.5 opens after 4:30 pm and is tucked away in a corner which gives it a more intimate feel. On our last night, we stopped in for a Whiskey Mojito that was quite refreshing and, because they also serve small snacks, also had a Maple Hazelnut Chocolate Truffle. The Delta Toronto also has a fitness center that is open 24/7 and has cardio equipment and free weights. We’ll be honest here and tell you that we only walked into this part of the hotel to take a picture lol! However, the Delta Toronto also has a heated indoor swimming pool (with a whirlpool!) and we did spend some time there because the views from the patio were pretty phenomenal. But what we loved the most about the hotel, besides the breathtaking views, was it’s location. Most of the attractions and neighborhoods we wanted to see were either within walking distance or a short Uber ride away. Whether you’re traveling as a family or as a couple looking for some nightlife, everything was close by. Another thing to keep in mind is that Union Station is only two blocks away which is perfect if you’re coming in by train. Pro Tip: There are two Toronto airports. If you’re flying into Toronto Pearson International Airport (YYZ), take the UP Express train to Union Station. The trip takes 25 minutes, with trains leaving every 15 minutes and tickets costing $12. If you’re flying into Billy Bishop Toronto City Airport (YTZ), take the free shuttle. It leaves from outside the main terminal to Union Station every 15 minutes and the trip takes approximately 15 minutes, depending on traffic. So would we go back to the Delta Toronto? Absolutely! We loved all of the amenities, the food, the free WiFi throughout the hotel, and of course, the great location. If you’d like to book a room, you can book it directly on the Delta Toronto website. This looks like a fantastic location. I don’t know when this started to be the case for me, but it’s really important to have good outlets in proper locations. It’s hard enough to keep everything charged now without there being a lack of outlets. Also love having the minifridge and coffee maker. It’s the little things that really matter. It looks like the Delta is a really nice hotel! I like modern hotels and their amenities and this one is just about that. That tub and bathroom with views looks amazing! Great food selection as well. Love the convenience of the location of the hotel. This really sounds amazing with everything needed for a great stay. The equipment at the gym is nice and modern and an important consideration for me 🙂 Nice review and will keep it in mind for my next trip to Toronto! Seems to be lovely location to stay. Generally gyms are not found in hotels but this one does, which is cool. Love the views from the floor to ceiling windows! It looks like it’s in a great location in Toronto too. Being right in the heart of things is always important to me when selecting a hotel. Sounds like the unique kind of urban hotel I’d love. If the locals hang out at their restaurant too – all the better. This looks amazing! Definitely will need to keep them in mind for when I visit Toronto. Those views are stunning! I will definitely be staying when I eventually travel to Toronto. Looks like a great hotel with awesome views too! The location of the Delta can’t be beat. It is really right in the center of it all downtown. Yet still close enough to Toronto Island (one of our fave spots in TO), Distillery District, Queen Street, and lots of other great spots. Glad you enjoyed your stay! I don’t know what sounds better, the view, the tub, or that food? Looks like a perfect place to launch off from when exploring Toronto. Will have to keep it in mind when I finally visit.